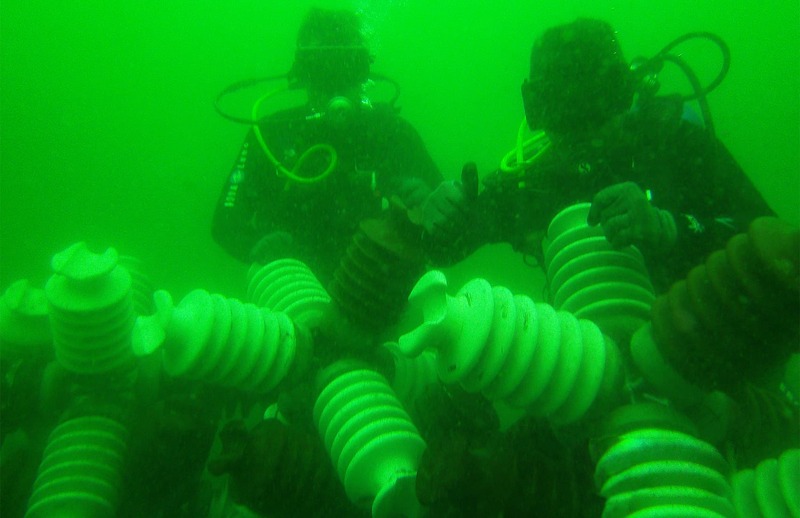 Eight divers from the Costa Rican Electricity Institute (ICE) are using waste material from the national electrical grid to build a structure expected to become an artificial reef. The institute reported on the progress of the initiative this week. Divers began sinking and anchoring 52 structures at Playa Hermosa in Guanacaste in December; the structures are made of discarded porcelain insulators, the cylindrical, accordion-shaped objects used to isolate electrical currents on utility poles and at power stations. Insulators are being stitched together in an 8-meter-long (26 feet) module that can be further attached to similar modules into a bigger structure. The first structure is already anchored at the bottom of the sea at some 9 meters (29 ft) depth, according to the ICE. ICE Socio-environmental Coordinator Walter Arias Alvarado said the results so far have been satisfactory. “The structures are correctly anchored and are stable. Small fish are already settling on them,” he said in a written response to a Tico Times query. 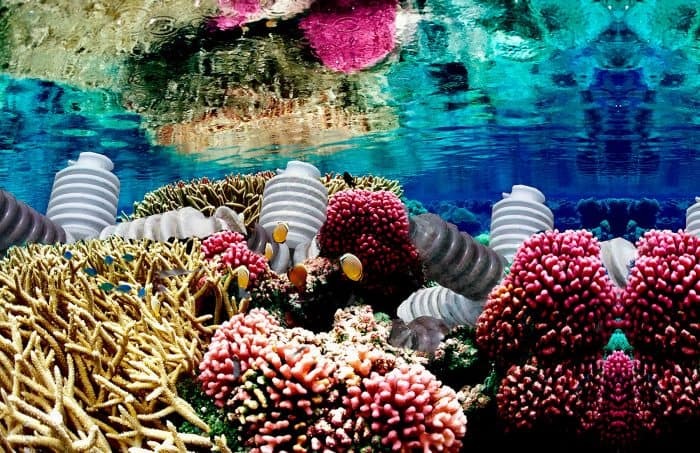 “Now we are expecting algae to begin adhering to the module so that coral, polyps, fish and other marine species begin reproducing,” he added. Divers will conduct monthly inspections of the project in order to document and evaluate the results. If initial results are positive, they will continue adding more lines so that the artificial reef can reach a height of 1.3 meters (4 feet) and 6 meters (19 feet) in diameter. ICE marine biologists estimate that if the reef project is successful, the maritime ecosystem of the area will advance its evolutionary cycle between 100 and 150 years, taking into account that a coral grows approximately one centimeter per year. Arias said data collected about the reef during the next six months will be published in a scientific paper and also taken into consideration as officials decide whether to expand the project. The project is part of an ICE plan to reuse waste materials from the power grid that would otherwise be stored or discarded. The artificial reef initiative was created two years ago, when research was conducted on how to reuse porcelain insulators when they need to be replaced. More than half a million insulators are used along the national electrical grid, and those that get replaced are currently stored in warehouses. Before moving forward with the construction, ICE biologists conducted laboratory tests to ensure that the materials did not pose any risk to marine life. Researchers kept the insulators inside salt water chambers for periods as long as 350 hours to see how the material would behave under the sea and to rule out leaks of any pollutants. The insulators were then evaluated under Environment Ministry protocols to certify that they’re free of any hazardous material. “Results from both tests were negative in pollutants that might affect the environment,” Arias said. ICE is carrying out the project in coordination with the Environment Ministry and the local group Playa Hermosa Artificial Reef Project, which began building artificial “fish condos” in the bay in 2010. The agency also contacted tourism businesses in Playa Hermosa, and Arias said most have been receptive to the plan. The bay’s artificial reefs could attract tourists interested in diving and some have suggested creating “reef trails” for diving tours, Arias said.